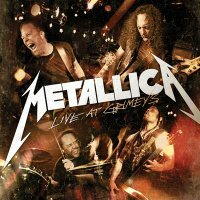 Disponible uniquement via un réseau de 700 revendeurs indépendants US, l'EP contiendra le set que MetallicA a interprété lors de la première du "Record Store Day" le 12 juin 2008 devant une poignée d'heureux membres du Metclub. L'EP se déclinera sous forme de CD et vinyle 10" et sortira le 26 novembre. "The EP includes the nine songs we played the afternoon of June 12, 2008 in the basement at one of the coolest record stores in the nation, Grimey's in Nashville, TN, and is part of the series of "Live At Grimey's" releases. How did this show come about? In late Spring of 2008 while we were finishing up "Death Magnetic," we were also having fun playing a few shows including the Bonnarroo Festival in Manchester, TN. As fans of classic old school record stores, we knew we just had to visit Grimey's and they were kind enough to invite us to play in their "basement" club for Metallica Fan Club members and a few friends. As we always do, we recorded the show... and now it comes to you on CD and 10" vinyl in a gatefold jacket on "Black Friday," November 26"